Before purchasing surge protectors, you should conduct an inventory of your sensitive equipment. 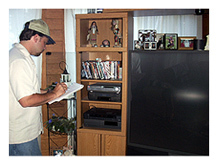 This inventory is simply a walk through your home to determine where and what type of sensitive equipment you have. One of the most important performance characteristics of a surge protector is its "clamping voltage." This is the voltage the surge suppressor allows to pass through to your equipment before diveting to ground. The lowest clamping voltage recognized by UL is 330 volts or .33 kilovolts. The product's clamping voltage will be listed on the product next to the UL label if it is UL listed. Select only those plug-in protection devices with a 330 volt clamping voltage. 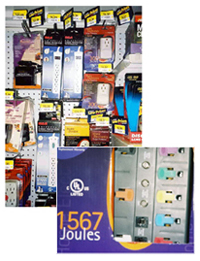 Some manufacturers list very low clamping voltages on their label or in their product literature. View this information for what it really is ... marketing hype. Always use the UL number as your purchasing guide.